If one viewed Twitter seconds after The 91st Academy Awards announced its Best Picture winner, one would believe that this was the worst year ever. How could a film like Green Book beat more culturally relevant films like BlacKkKlansman or Roma? In some ways, it can be viewed as the perfect metaphor for a year of constant controversy where Academy President John Bailey tried (and failed) to introduce a Best Popular Film category, cut out several music acts, and go forward with no hosts. No matter what, this year was threatening to be different and many wondered just how well that turned out. Those who stopped at Green Book's Best Picture win, much like the other controversial missteps, didn't recognize how great this year was in small ways. It's a year where diversity was recognized, which shows that even if you view Green Book as a regressive winner, there has been inevitable change since the Oscars So White controversy of three years ago. This may have not been the most beloved Academy Award year, but it's far from the contrived mess people wanted it to be. In some ways, the Best Popular Film category is something that lingered over the entire ceremony months before it started taking shape. It was raising the question: what makes a film great, and what makes it popular? Considering that the Academy Awards are the premiere American award show, there's a need to appeal to the masses in a way that isn't just stuffy dramas. In 2017 and 2018, the Best Picture winners (Moonlight, The Shape of Water) embodied a triumphant shift to a more compelling, different Academy full of younger, more diverse voters. Part of appealing to a wider audience is recognizing that part of being popular is appealing to more mainstream tastes. For better or worse, that's where Bohemian Rhapsody (in all its controversy) came from. It's where A Star is Born and Black Panther came from. While Bailey may be one of the least effective presidents of the modern era, what he pulled out this year was an incredible hat trick. It was a year of compromise and shift, doing its best to appeal to a changing demographic where social media is omnipresent. While Bailey's ideas were quite poor, his choice to hold discussions with Academy members in the wake of these incidents shows that he was aware of his mistakes. For as much as their mistakes were notoriously present in conversation, leading many to suggest that they were loathing The Oscars, the fact that nothing changed radically shows that discussions were allowed to be had. Sure, there's better ways to publicize it, but this year was a learning curve in what was likely intended to be a shift to a younger, more streamlined Oscars for a new generation. It can be seen in how the show was put together, relying more on great speeches than interstitial bits that don't have replay value on YouTube. In fact, it took out the parts that had the most criticism, again for better or worse, and created a show that was more appealing than it had any right to be. The lack of hosts hasn't happened often in The Academy Awards' history. The last time that it happened was in 1989 amid a controversy that caused members to write a letter to never have such an appalling opening performance. Cut to 30 years later and you get a retry at this idea and pull off a miraculous hat trick. Sure, the choice to open up with Queen and Adam Lambert singing "We Will Rock You" and "We Are the Champions" seems a bit pandering and obvious - fitting more in line with the Grammys than Oscars - but the camera's busy movement showed how much audiences were into seeing the living legends perform live. Even the enthusiastic clapping that followed showed that it went over well. By the 90 minute mark, half of the awards were handed out without too much downtime. It was the miracle year because the part that many feared (cutting out bits not related to awards) actually enhanced the show. It could just be preference, but the thing that came across the best for this new format was the speeches. There was controversy surrounding the idea of moving four categories to commercial, and there was even some skewering by various presenters. By not having to cut to a host doing a two minute gag allowed every segment to flow smoothly. While some ceremonies did this to miserable payoff (see: The Emmys in 2018), The Oscars managed to never have one person overstay their welcome. The presenters were usually in and out in a reasonable time, never having to do a Russian Doll of presenters presenting presenters presenting winners that often felt nauseating. It got to the point, and that allowed for the speeches to become more emphasized. After all, it's what the show should be about just as much as the awards. For years and decades, people remember the iconic speeches, and this show was an embarrassment of riches. With limited exceptions, everyone presented some form of a speech that was delightful and enthusiastic. There was the excitement of Best Documentary Short winner Period. End of Sentence. going crazy because a menstrual story won an Oscar. It's small things like this that general audiences likely wouldn't recognize elsewhere. It's the moment where winners who aren't bonafide celebrities get to make a great impression. If anything, it will convince new audiences to discover entertainment that is outside the mainstream. As much as this was a year about popularity, moments like this reflected how there is a need to represent "the little guy" in everything, including the technical arts. It was also a moment to reflect on the fact that, after so much controversy, many women were winning primary categories, including several as directors. They weren't just white women either, as Best Costume Design went to Ruth E. Carter, who gave one of the most impassioned speeches of the night. 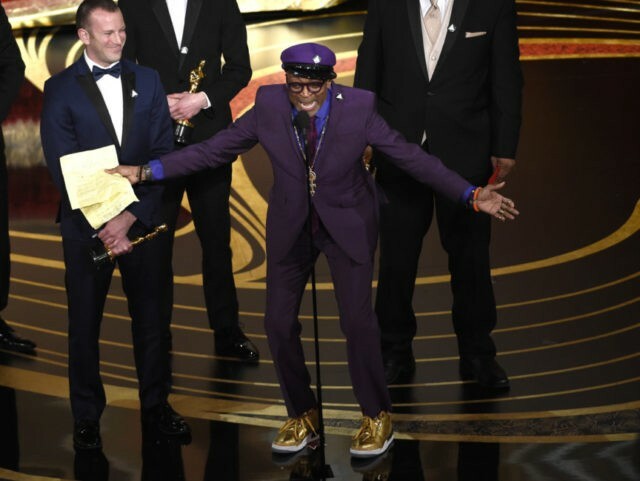 Of course, the one thing that most people are likely to remember is the enthusiasm of seeing Spike Lee win Best Adapted Screenplay. It's long been accepted that he's been overdue for an award. Samuel L. Jackson's enthusiasm as he presented him with the Oscar shows how much this moment meant to them. Lee has been considered an outsider to The Academy in spite of winning an Honorary Oscar a few years back. His confrontational style likely appealed to a younger crowd at this moment due to the fraught political climate in America. He didn't let this moment go without showing just how excited he was, even jumping into a hug with Jackson. His speech (already criticized by the president) called for people to "do the right thing" in the 2020 American presidential election. In a year where most speeches were apolitical, his emphasis on American history and making a difference stood out. Then again stories that he rebelled against Green Book winning Best Picture have overwhelmed the conversation. If anything, it shows the power of Lee as a commentator as well as an artist. While one could argue how good the quality is, three of the four acting winners went to LGBT-inspired roles. There is of course Rami Malek for playing the bisexual Freddie Mercury in Bohemian Rhapsody. Mahershala Ali won for playing Don Shirley in Green Book, though his sexuality wasn't as explored. Meanwhile, the speech of the night went to Olivia Colman for playing Queen Ann in The Favourite. Her candid feelings about winning over expected winner Glenn Close showed a side of The Oscars that is fun. Having those few twists makes the ceremony worth watching. Colman's heartwarming speech that felt off the cuff was full of humor and generosity. It's one of those wins that cuts through the nonsense of every controversial decision and makes you want to believe that these awards mean something greater. Yes, every year has a few upsets (many consider Green Book the worst Best Picture winner since Crash), but it's hearing those speeches from people dedicated to their craft that makes you want to believe the better, especially in a night that perfectly reflected why movies are special: the people accepting the awards, no matter how famous they are. It is true that the winner was one of the least groundbreaking of the bunch. There wasn't any profound statement in BlacKkKlansman pulling a Best Picture upset. There wasn't any commentary about other cultures and online streaming with the expected Roma win. With that said, every other category reflected some shift towards a modern and more progressive voting body. Green Book is one of those consensus films that feels classical and comes around once in a five year span. It came with The King's Speech and then Spotlight, and now Green Book reflects a milquetoast view of racism that goes down easy and doesn't push cinematic boundaries. Could there be a better winner? Most people would say yes. However, to let this deny the fact that this was the year that TWO superhero films won Oscars (a rare achievement given the genre's popularity) is a long-awaited breakthrough. The fact that Spider-Man: Into the Spider-Verse reflected a protagonist not often seen in superhero cinema is a fact that gets ignored. Yes, Green Book is conventional, but then again the voting body is diverse and, like everything else this season, there had to be some consensus. After years of radical picks, Green Book was the one that edged out this year. There's still room for growth in The Academy, but Cheryl Boone Isaacs' quest to have a more diverse body is starting to become more true. While there's categories that are clearly clashing with young and old voters (or people who don't know what editing is), the change can be seen if you watch more than the Best Picture winner. Alfonso Cuaron showed up three times with each win marking a major achievement (Roma is Mexico's first Best Foreign Film win). If you're mad that Green Book won and demote this to a bad year because of that, please look at the other speeches. Don't stop if you don't know who is winning. Just look at how things are changing. Much like the Best Popular Film controversy of last summer, things changed because we were allowed to come to a compromise. The ceremony reflected this in a shaky but totally effective manner. There's a few bum winners out there, as to be expected. However, it's a year that's far better than it had any right to be. Who knows. Maybe Bailey will get his wish of a ceremony under three hours. For the first time ever, that seems plausible and not embarrassing. All it will take is a little more fine tuning.